A detailed ski resorts comparison will help you make the most of your winter sport vacation. Planning a budget is one of the primary steps involved in making a ski resorts comparison. Begin by determining which amenities are "must haves," and which you can do without. Then, calculate the costs of lodging and travel. Loveland, for example, located in Colorado, is an inexpensive resort, but the cost of travel will involve airfare, as well as car rental from Denver International Airport. Next, look at a trail map to determine whether there is adequate terrain for your skill level. Snowbird, located in Utah, boasts the country's most challenging green-rated terrain, and may be an uncomfortable choice for beginners. Likewise, Smuggler's Notch, located in Vermont, is a family-oriented resort, with lots of beginner terrain, but may not offer adequate challenge for advanced skiers and snowboarders. If you plan to travel with non-skiers or snowboarders, or if you simply want to combine skiing and riding with other activities, resorts such as Stowe, Vermont, Breckenridge, Colorado and Park City, Utah are surrounded by quaint shops, art galleries and historic museums. 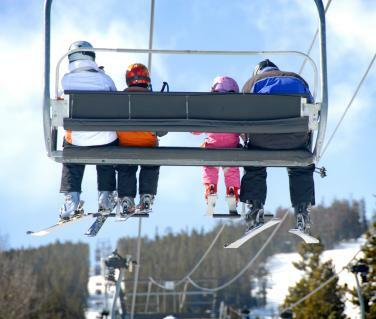 In contrast, resorts such as Sunday River in Maine have limited off-slope activities. It's hard to make ski resort comparisons without talking about Eastern skiing vs. Western skiing. This topic is often the subject of heated debates amongst snow sports enthusiasts, but it's really a matter of personal preference. Western resorts are more likely to get powder conditions, but that powder comes at a price called high altitude. If you live at sea level, you may need a few days of acclimation before heading out to the slopes. Eastern resorts tend to get more ice, but skiers from Eastern states are usually accustomed to it. Western ski resorts are significantly larger, but this is less significant if you don't ski the entire mountain. Some people take a winter snow sport vacation to bond with their family. Others visit ski resorts with the hopes of meeting someone with whom they may eventually form a family of snow sport enthusiasts. A third group, perhaps inspired by the movie Hot Tub Time Machine, just likes to party. Some resorts, such as Hidden Valley in Pennsylvania, were set up with families in mind. Aspen, Colorado is actually composed of four ski resorts, each with its own personality. Snowmass is family oriented, whereas Aspen is more of a party town. The Lake Tahoe ski resorts, because of their proximity to bars and gambling casinos, have an active social scene. High-tech modern ski resorts vs. old-style, classic ski areas is another way to make a ski resorts comparison. If you like high-speed lifts, on-slope dining and an active ski village atmosphere, you will probably prefer the larger, more commercial resorts. These ski resorts are usually owned by a resort corporation, such as Intrawest, Boyne and Powdr. In contrast, smaller resorts, which are actually referred to as ski areas, have older lifts and fewer amenities, but what they lack in convenience and glamour, they make up with friendliness and authenticity. Mad River Glen, a skiers only resort in Vermont, is an example of the latter. Skiing overseas is a completely different experience. While some resorts are privately owned, many of the mountains belong to the town, and competing chair lift services and ski schools set up shop on the mountain. Both Europeans and South Americans make a big deal about dining. Breakfast is savored and enjoyed. Unlike North American skiers and snowboarders, who rush to the slopes for first tracks, Europeans and South Americans rarely arrive at the lifts before 10:00 am. Lunch is a long and leisurely affair, which may involve alcoholic drinks. Skiing and snowboarding are expensive sports, so don't compromise on your preferences. With so many resorts to choose from, it's easy to find one that suits most of your needs.